The interactive portion of the annual 10-day South by Southwest festival in Austin is starting to wind down, and while the latest in 3D printing has been on display, along with some well-attended talks by tech innovators, there's been little talk of game changers. It appears the biggest star to emerge from the festival is Grumpy cat -- the photo meme feline that replies to mundane statements with cranky one-liners. The cat with an adorably bad attitude was touted the star of the show by several news outlets, and has proven to be a major draw at Mashable's camp at SXSW. 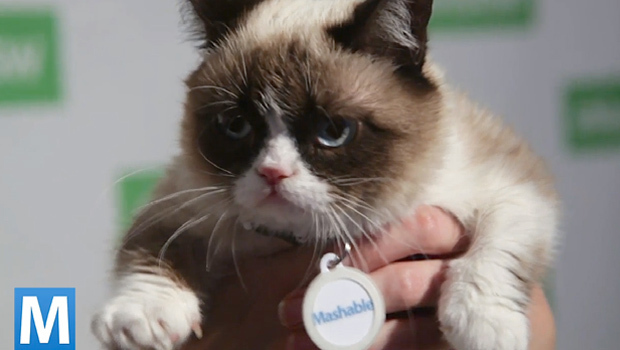 CNN crowned Grumpy cat as the biggest star of the festival. National Public Radio reported that the line to take a photo of the cat wrapped around a city block. And CNET points out that if a small feline is the biggest news of a show with tens of thousands of attendees, trouble may be brewing. There was actual news to come out of the event. Keynote speakers like Microsoft founder Bill Gates, former Vice President Al Gore and Tesla founder Elon Musk gave noteworthy talks. Last week, Gates gave a keynote address highlighting the need for innovation in education. According to Fast Company, Gates argued that not much has changed in education technology and that the market is about to hit a "tipping point." The tech legend implored educators and technologists to work together and cited the integration between developers and the biotech industry. In a talk with journalist Walt Mossberg, Gore made a splash on Twitter when he noted popular mobile app Snapchat -- a messaging app which is most known for deleting a chats quickly, thus avoiding a digital footprint. According to CNET, Gore raised eyebrows when said that we live in a "stalker economy" and hopes that the success of the app could cause people to reach a digital gagging point. Snapschat's success suggests that the idea of frictionless sharing, which has been at the core of Facebook's philosophy, may not be a cultural phenomenon that is sustainable. The social network recently launched an app to compete with Snapchat, but reception has been mild. Perhaps the most memorable statement at SXSW has come from Musk, who declared that he wanted to die on Mars. Musk is also the founder of the private space transportation company that is noted for successfully delivering supplies to the International Space Station. CNET reports that Musk spoke of his hope that humans will someday be able to make it to Mars. And that he would like to take the journey himself. "I've said I want to die on Mars," he said. "Just not on impact." Hardware seems to be stealing the show at this year's SXSW. Several 3D printing companies have a strong presence at the festival, including MakerBot. The company's CEO Bre Prettis gave the opening keynote speech last week to introduce the company's newest product, the MakerBot Digitizer. The printer is said shorten the time from scanning to print. There are currently no details on how much the device will cost. Another device getting attention is the Leap Motion 3D motion-control device. Using a USB connection, the device creates four cubic feet of space to interact with a computer. The controls are similar to using a touch screen computer in the air. The device was introduced in May 2012, but the company recently released a software development kit for iOS devices. Even with the impressive lineup of tech luminaries and new hardware, the most buzzed about topic remains the moody feline. CNET senior writer Daniel Terdiman points out that in the past, SXSW made a splash because it was a launching board for startups like Twitter and Foursquare. But this year, there isn't a clear breakout of the same caliber. SXSW Interactive ends on Tuesday. The festival kicks off the music portion on the same day.